5 Princes Gardens, London, England is an address that no longer exists today, yet its interior rooms become familiar after looking through Clementina Hawarden’s photographs. In Hawarden’s pictures, we often see the same sun drenched spaces, and can even trace the growth of her children over the years. Hawarden, born Clementina Elphinstone Fleeming, was one of the first female photographers in Britain. Most of her work was made while she was living in the Kensington neighborhood of London, near the present-day Victoria & Albert Museum that currently holds the collection of her photographs. Hawarden was born on June 1st 1822 and grew up outside Glasgow, Scotland. Her father was an admiral in the navy and her mother was a Spaniard renowned for her beauty. Hawarden married Cornwallis Maude, 4th Viscount Hawarden, in 1845. Together they had ten children, eight of whom lived to be adults. Because Hawarden did not keep a diary, and few of her letters remain, most of what we know about her is based on these brief biographical details and her numerous photographs. Accordingly, Hawarden is often written about as both a maternal figure and a prolific photographer. The majority of her images depict her children, posed before the camera, within their familiar domestic setting. In the image above we see two of the photographer’s daughters situated in front of a large window that lead out on to the upper story balcony. The standing figure, Florence Elizabeth, looks to be in the act of drawing the curtain, and we see small houses in the background. Many of Hawarden’s photographs feature these same windows. In a practical sense, the windows provided ample light into the interior space and allowed Hawarden to make her pictures. This double image is a stereographic print—a popular medium in the 1860s. When this image was viewed through a stereoscope it created an illusion of depth, making it look as if the two girls have are popping out in three-dimensional space. 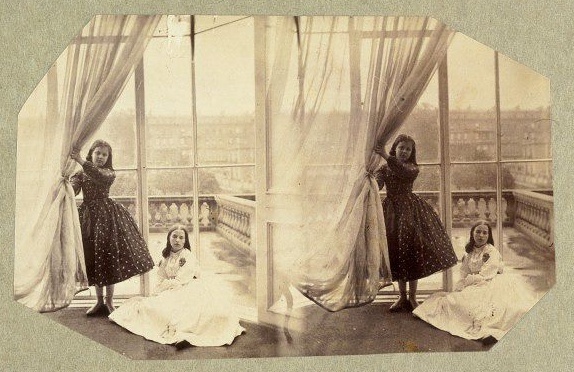 Here, the same sisters pose again in front of the large French windows. This time they are in costume, which is a common element in Hawarden’s later photographs. Clementina is reclined on the floor, wearing classical dress and a star headband. She is an ancient prophetess or muse. Florence Elizabeth stands above her, dressed as a nun or saint. The dramatic shaft of light coming in from the window creates diagonal shadows and highlights on the wall, emphasizing the dramatic quality of the photograph. Hawarden used the most popular printing process at the time; her photographs are albumen prints made from wet collodion plates. 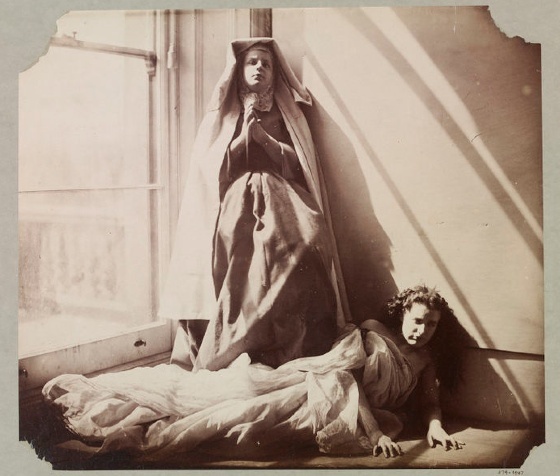 What did it mean to be a female photographer in nineteenth century England? For a woman of Hawarden’s elite class it would not have been considered appropriate for her to sell her photographs. She did, however, exhibit her pictures with the Photographic Society of London in 1863 and 1864. The Photographic Society of London, of which Hawarden was a member, later became the Royal Photographic Society and is the oldest national photographic society. Hawarden was a well-regarded photographer who was celebrated by the photography community. In both years that Hawarden exhibited her work the society awarded her a silver medal. Why are the photographs an irregular shape? When you look at Hawarden’s photographs today, you might notice that the corners of the images are either cut or torn. They are typically displayed showing the piece of paper on which they are mounted (the light green or gray solid color that borders the photographic image). Some scholars, such as Carol Mavor, choose to take the jagged edges of the images into account while writing about Hawarden’s work. Indeed, it is interesting how the edges of the pictures often echo the shapes seen in the photograph, and create a repeating rhythm that is now part of viewing Hawarden’s work. One must keep in mind, though, that this would not have been how the photographer saw them, or conceived of them, in the 1860s. When Hawarden made her photographs she pasted them in to albums, many of which served as gifts. The tears that we see today are a result of the images being removed from these albums. Hawarden’s daughter, Isabella, stored the photographs in a closet for safe keeping for many years. In 1939 the Victoria & Albert Museum in London had a special exhibition in honor of the first 100 years of photography. Much to Hawarden’s granddaughter’s disappointment, the exhibition did not include any of her grandmother’s work. After this, her granddaughter, Lady Clementina Tottenham, donated 775 photographs to the museum. Thanks to this generous donation, much has been learned about both Hawarden and nineteenth-century photography. Cite this page as: Leila Anne Harris, "Lady Clementina Hawarden, Clementina and Florence Elizabeth Maude," in Smarthistory, August 9, 2015, accessed April 19, 2019, https://smarthistory.org/lady-clementina-hawarden-clementina-and-florence-elizabeth-maude/.